Nearly halfway through this whale-watching season, Birch Aquarium naturalists continue to enjoy their time aboard Flagship Cruises & Events’ 100-foot boat, the Marietta. 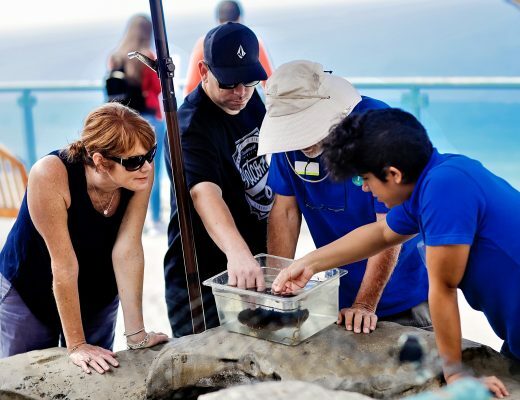 Birch Aquarium’s 14-year partnership with Flagship brings together aquarium naturalists and a skilled crew to bring passengers memorable whale encounters. On Monday, February 10, Birch Aquarium will also host an evening lecture to describe how whales experience the ocean through sound. Read on to find out more. A sailboat lurched out of the fog towards the Marietta’s port side. The two whale-watching boats seesawed in unison as waves broke and rolled under their hulls. Captain Will throttled the Marietta into idle. As the boat slowed, passengers waited quietly, hoping that the three gray whales we were following would surface nearby. Captain Will navigated the boat skillfully. Fog from the west had blown in swiftly, and within 10 minutes, visibility plunged to 150 feet. We were in good hands, though—this was an experienced crew. As we continued onward, my thoughts wandered to Birch Aquarium’s recent Perspectives on Ocean Science lecture and how whales would have no difficulty traveling in such fog. Whereas humans predominantly navigate using vision, whales rely on hearing. This is particularly relevant for beaked whales, which have poor vision but exceptional hearing. These whales are among the deepest diving mammals. A beaked whale recently set a new record by diving to 9,800 feet for more than two hours! On deep dives, beaked whales use echolocation to hunt deep-sea squid. Still, many other aspects of their biology remain a mystery. As deep divers living in the open ocean, beaked whales are elusive and challenging to study. Basic information is lacking for many of the 21 known species. With so little chance of visually sighting these animals, biologists have turned to the sounds beaked whales make for answers. Simone Baumann-Pickering presenting her findings at Birch Aquarium at Scripps. 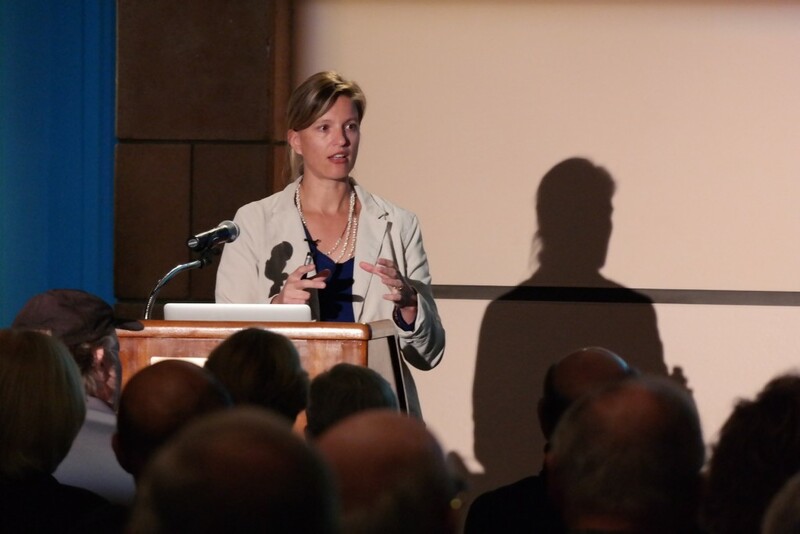 Simone Baumann-Pickering, a research scientist at Scripps Institution of Oceanography, studies the distribution of beaked whales and how human activities may influence their behavior. Her laboratory uses stationary sound-recording devices and computer algorithms to distinguish the sounds of beaked whales echolocating from a background of other ocean noise. So far, Baumann-Pickering and her team have identified 10 species-specific echolocation signals—10 unique sound patterns to monitor each species’ presence in the Pacific Ocean. Some of these species had previously only been known from stranded individuals. Her discoveries of novel echolocation signals, which do not match known species, may also be evidence of beaked whales new to science. “The deep is anything but silent,” Baumann-Pickering says, and the baseline data her lab is collecting will be invaluable in decades to come. With increasing human activity at sea, the planet’s ocean soundscapes are changing. During February’s Perspectives on Ocean Science lecture (see below), whale biologist Ana Širović will discuss whales’ sensitivity to sound exposure and how human use of the ocean may be influencing their communication. Scientists and whales alike are busy sifting through the noise. Birch Aquarium whale watching tours depart twice daily at 9:45 a.m. and 1:30 p.m. from Flagship Cruises & Events at 990 North Harbor Drive in downtown San Diego. Many marine animals produce a variety of audible as well as infra- and ultra-sonic sounds for navigating, finding food, mating, and many other vital behaviors. With human use of the world’s oceans on the rise, background noise levels in the marine realm are increasing. Join Ana Sirovic as she discusses how ocean noise varies across the Pacific Ocean and what this may mean for whales, fishes, and other animals that rely on sounds for their survival.